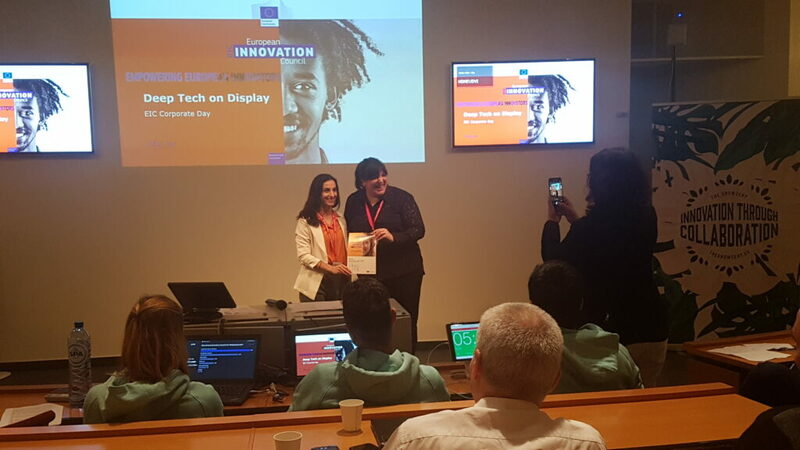 David and I (Maryam) were in Brussels last week participating in the Deep Tech on Display #EU_EIC Corporate Matchmaking Days for two very intense days at the Procter & Gamble Brussels Innovation Centre. Applications were limited to companies that had been granted EU SME Instruments funding, and only applicants hand-picked by the Corporate Partners were invited to participate. Having said that, this was one of the largest matchmaking events run by EIC with 102 SMEs from 25 countries pitching to and meeting with representatives from 24 Corporate Partners. Most of our time was spent meeting and engaging with corporate representatives, as well as getting to know other SMEs in the European ecosystem. The plenary talks gave excellent perspective into the history of companies like Procter & Gamble as well as the European Innovation Council’s strategy for empowering innovation in Europe in the upcoming years. I particularly liked the Reverse Pitch sessions where corporate partners presented their companies and spoke a bit on how they implement innovation and why they look forward to finding SMEs like us. Insplorion’s pitch went great; we took home two ”Best Pitch” awards, one based on audience votes, and the other based on votes cast by jury members. The training and support offered by the EIC community, especially the dry run for pitching, were definitely factors in our success. We also had a side adventure measuring air quality in central Brussels, which I will write about in the next post. And while David and I continue our follow-ups from the event, you can enjoy some of the pictures from the event below. PS: Keep a look out for my interview with EU EIC’s Marketing and Communications’ Pedro Pinto in the upcoming weeks. 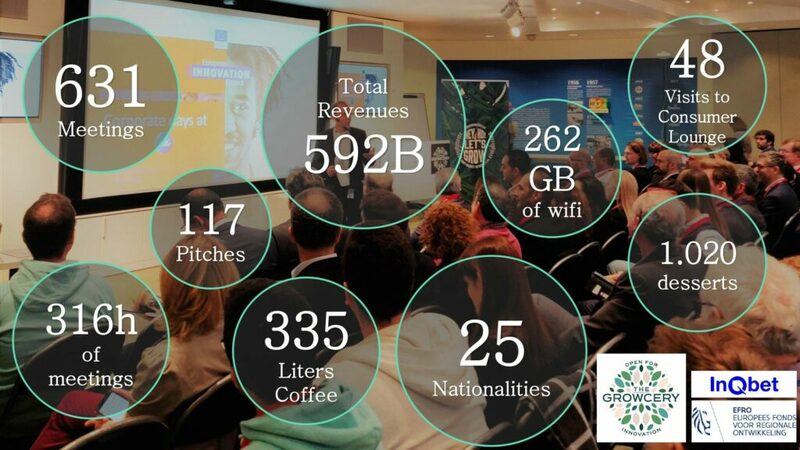 Many thanks to #EU_EIC, #EASME, The Growcery, InQbet Accelerator, and Procter & Gamble for organizing this event. 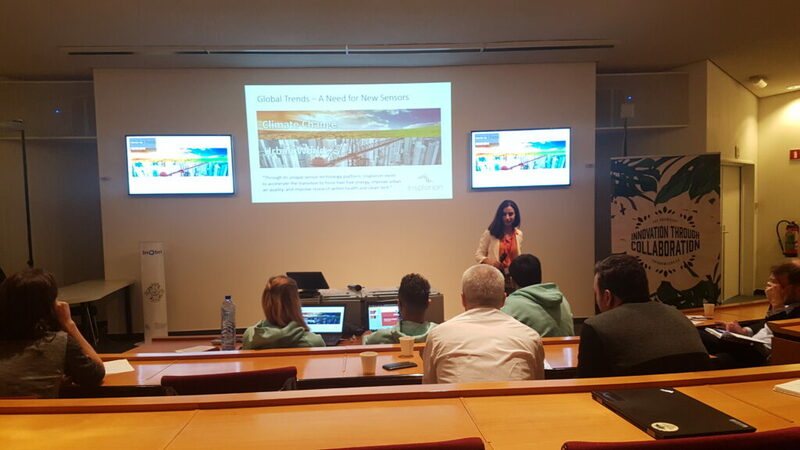 Thank you to all the Corporate Partners that attended: P&G, Cargill, Deme Group, ING, Ingenico Group, Nokia, Solvay, Umicore, Evonik, Colruyt Group, Belfius, Port of Antwerp, Worldline, Mastercard, EDF Luminus, Coca Cola, GSK, ABInBev, bpost, AXA, DOW. Olivier Houpert (Director Home Care at P&G and site leader at BIC) explaining how InQBet and The Growcery accelerate the innovation-to-production loop. Grzegorz Ambroziewiecz (Acting Head of Unit at EASME) calling for more innovation in Europe and giving a glimpse of future funding schemes for SMEs. Here at the end of the first day. With our brochures and prototypes, David and I met with over 25 representatives over the two days. Yours truly (Maryam of Insplorion) presenting our company in 5 short minutes. Receiving the audience award for Best Pitch. 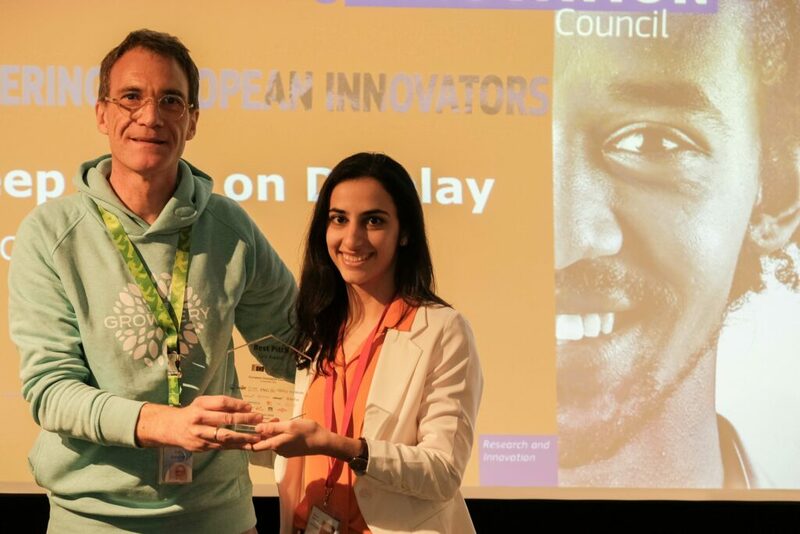 Receiving the jury award for Best Pitch from Andre Convents (Connect+Develop and Innovation Leader at P&G). Photo credit to Pedro Pinto. A look at our prizes. Pan shot of participants, though there are more on the sidelines. Photo credit to Pedro Pinto.